Aegina has a long history, dating from the Neolithic (4th millennium BC) to the later years. The high points in its history were the period if its great prosperity (657-459 BC) and the short period when it was proclaimed first capital and home of governor Ioannis Kapodistrias. Witnesses to this historical path are the hill of Kolona with its characteristic column and the findings of ancient settlements, Paleachora with its post-byzantine churches, the Temple of Afea, the public buildings of the Kapodistrian period, Mount Hellanion/ Oros and the monastery of Chrysoleontissa. 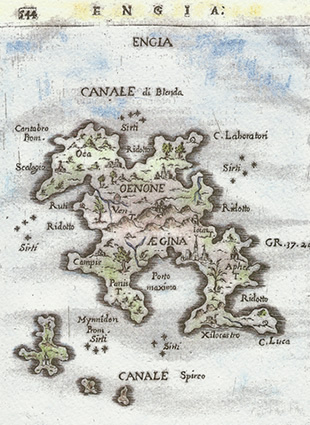 Orginally the island was called Inoni (or Inona or Inopia). Its name comes from Aegina, one of the 50 daughters of the river god Asopus, who was loved by Zeus. The king of Olympus, in order to avoid, Hera, tranformed himself into an eagle and carried Aegina to the so far uninhabited Inoni. 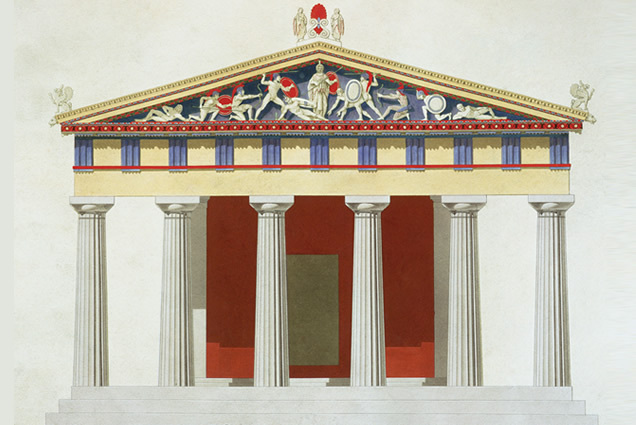 The fruit of Aegina's and Zeus' passion was Aeakos the first king of the island. Aeakos asked Zeus to give him subjects and so he transformed the ants of the island into humans for his skae. The first inhabitant of the island were called Myrmidones, from the Greek word "myrmigi" which means ant. The hill of Kolona, next to port of Aegina town, was inhabited from prehistoric times through the classical period. Extensive walls and foundations have been discovered and excavations are still in process. The Temple of Aphaia is arguably the jewel in the crown of Aegina island. It is a stunning example of ancient architecture set in a beautiful natural forested area with sensational views across the island to the sea. Located on a steep hill adjacent to the church and monastery of Agios Nektarios, it was the islands capital from the 9th century until the early 19th century AD). The setting itself is magnificent, especially in spring. From the 13th century until the first quarter of the 19th century, Aegina endured the successive rule of Franks, Catalans, Venetians and Turks, with two periods of rule alternating between Venetians and Turks. Kapodistrias was a fascinating figure. He served as a leader of the new country. 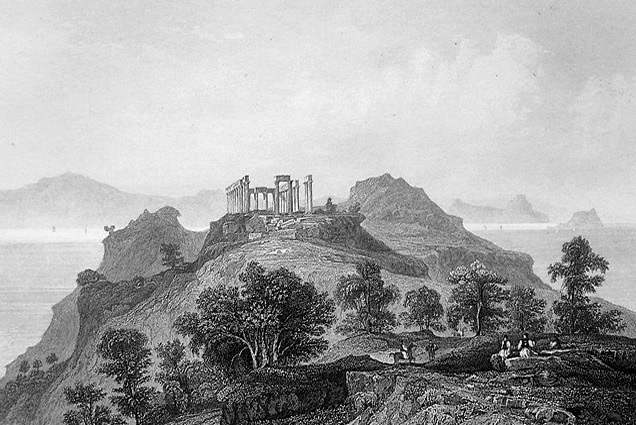 Aegina served as the capital of Greece from 1828 to 1829. Many buildings in Aegina town are testaments to this era. The House of Rodakis in Mesagros is a folkore building with peculiar features and of excellent aesthetics. It was built in 1880 by Alexandros Rodakis. Discussions about preservation of the house are still going on. A very impressive school project was carried out in the village of Mesagros by teacher, Maria Chaldeou in 2010. Schoolkids were engaged in an exploration of some of the older village houses of Mesagros and Vagia. In conversation with Mrs Lina Bogri Petritou, well-known for her talks and writing on the subject of life in Aegina in times gone by. She tells us some of her memories of her grandfather's stories of life in 19th century Aegina. Ta Stena Papoutsia, written by Zorz Sarri, is like her first book, O Thisavros tis Vagias set in the village of Vagia, during the 1930s. She is one of the most important modern Greek authors of children's literature. Argyris Fortunas has written three books based on his memories of the dark years of the German Occupation of Greece during WWII. In 1942 he spent eight months as an interpreter between local Greeks and the German occupiers in Aegina. Up until the 1950s, Aegina's mountain village of Pachia Rachi was the main village on the slopes of Mount Oros. It has been officially proclaimed a traditional settlement by the Greek Ministry of Culture.